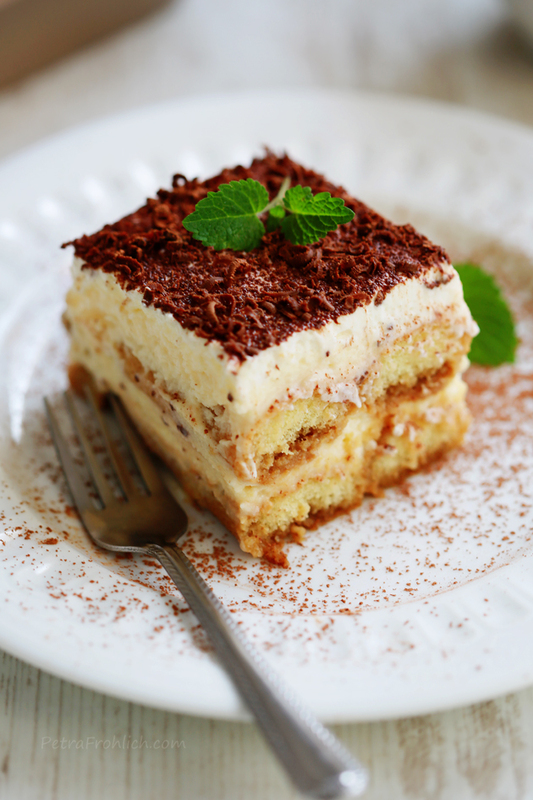 Tiramisu is one the most famous Italian desserts. It’s literal translation is ‘pick me up’ for the coffee that it contains. 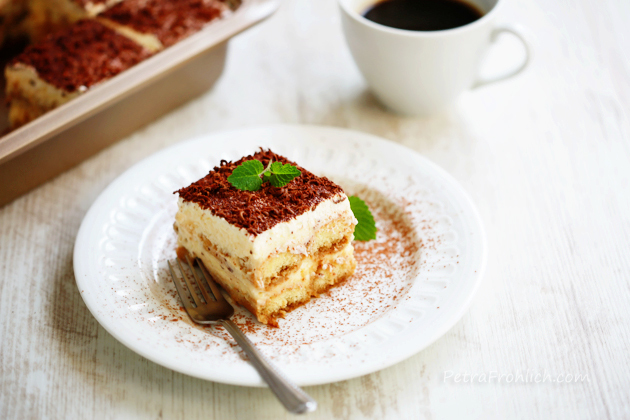 With its luscious layers of whipped cream, sweetened mascarpone mixture and ladyfingers softened by their dip in liqueur-spiked esspresso, it is a dream of a dessert indeed. 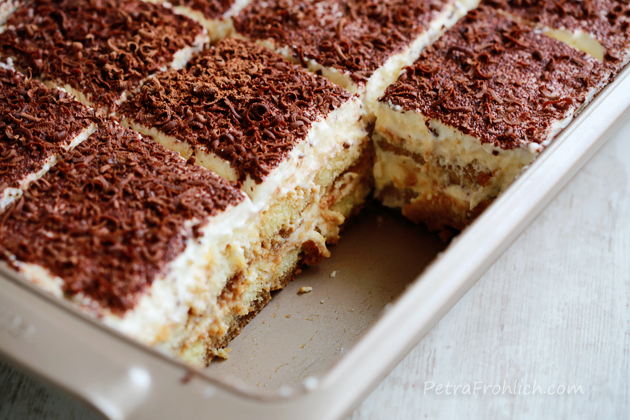 There are many versions of this favorite no-bake treat… and this is the one that I like very much. 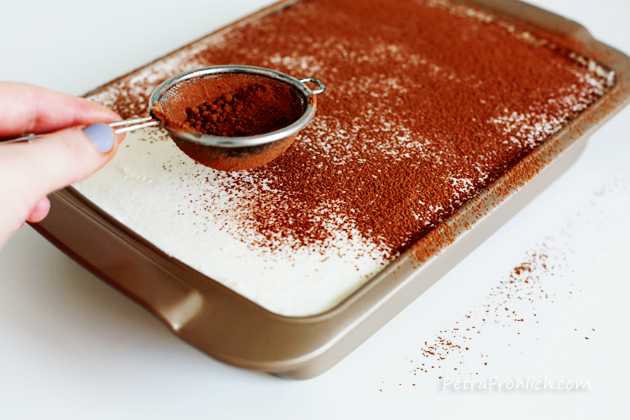 To make Tiramisu, in a large heatproof bowl or pot, whisk the egg yolks and 1 cup (115 grams) of sugar until smooth and pale in color. Place the bowl/pot containing the egg yolk-sugar mixture over a pot of boiling water (so that the bottom of the bowl does not touch the water) and cook for about 5 minutes, stirring constantly. Transfer the mixture into a larger bowl and allow to cool. 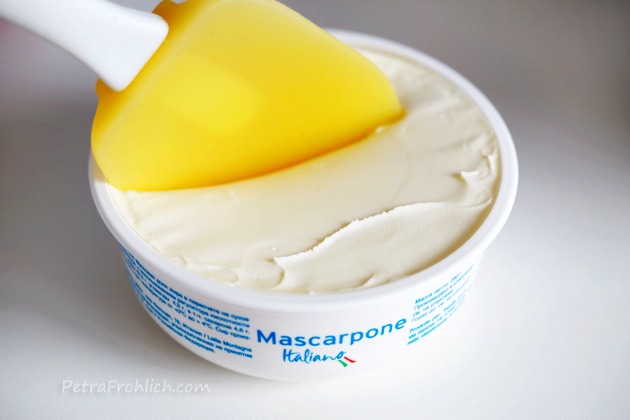 Now we need our softened mascarpone cheese. 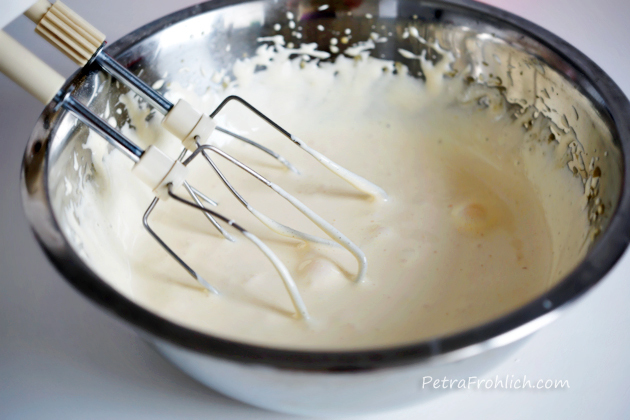 Fold the mascarpone cheese into the egg-sugar mixture. 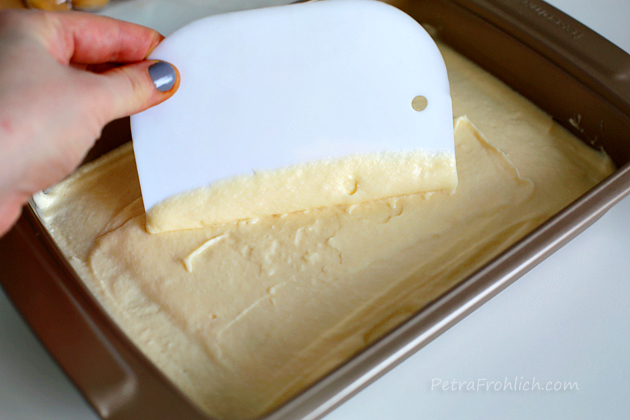 Beat the egg whites to soft peaks and gently fold it into the egg-sugar-mascarpone mixture. *Please note that the egg whites in this recipe are uncooked. It is recommended that those who are very old, very young, pregnant, or have a compromised immune system should avoid raw eggs. Place in the fridge until needed again. 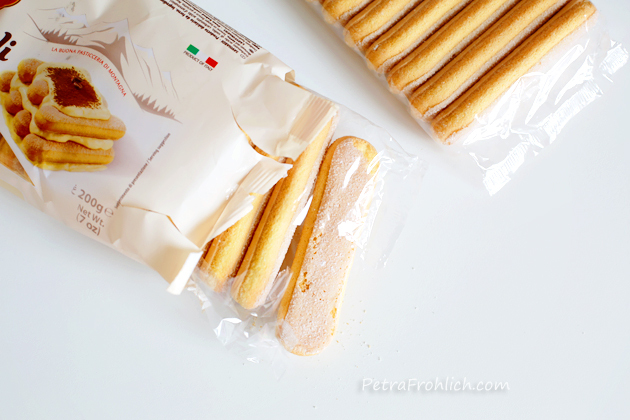 And now let the ladyfingers join the game. In a smaller bowl, combine the strong brewed coffee and liqueur. Let cool completely. 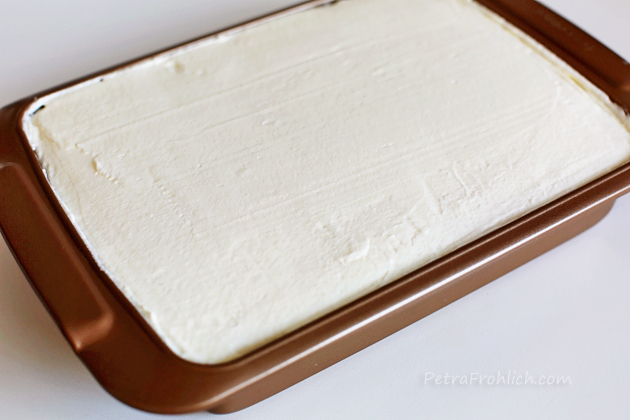 … and lay them in rows in the bottom of a 9 x 13-inch (23 x 33 cm) dish. 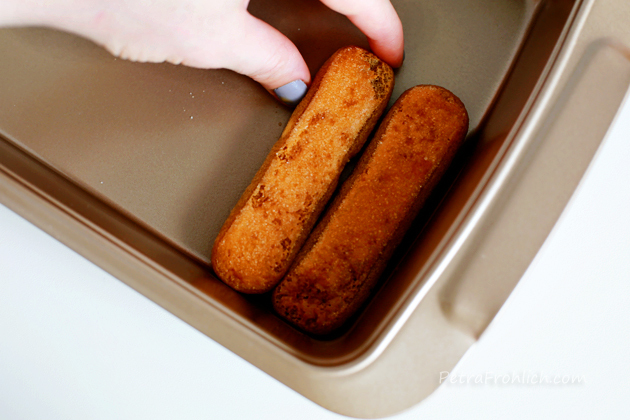 You may need to cut some ladyfingers with a knife to fit the size of the pan. 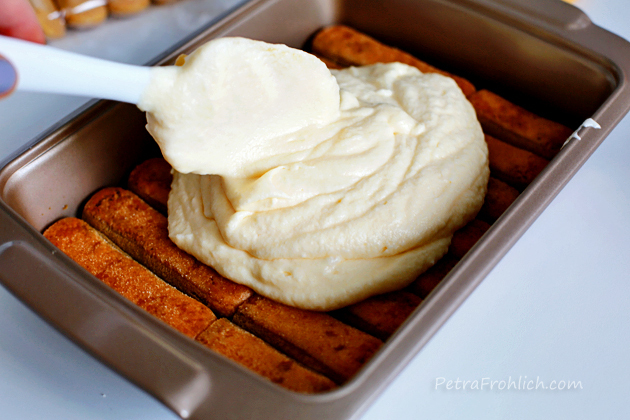 Spread half of the mascarpone cream on top. 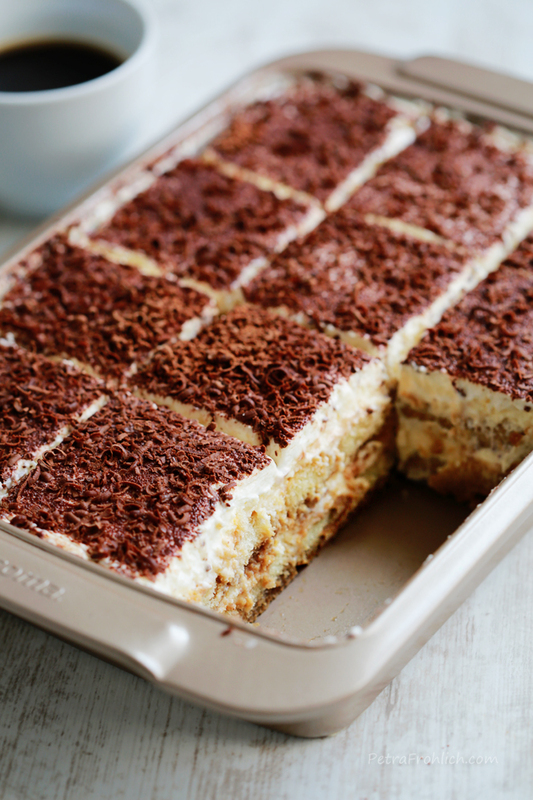 Cover the mascarpone cream with another layer of coffee-dipped ladyfingers. 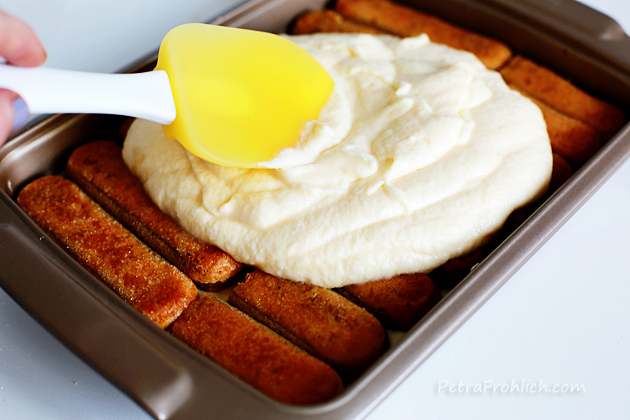 Then cover the ladyfingers with the other half of the mascarpone cream. 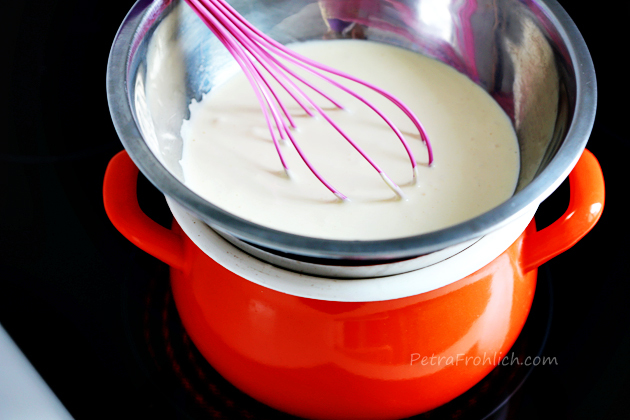 In a bowl of your electric mixer, place the heavy cream and 1 tbsp sugar. 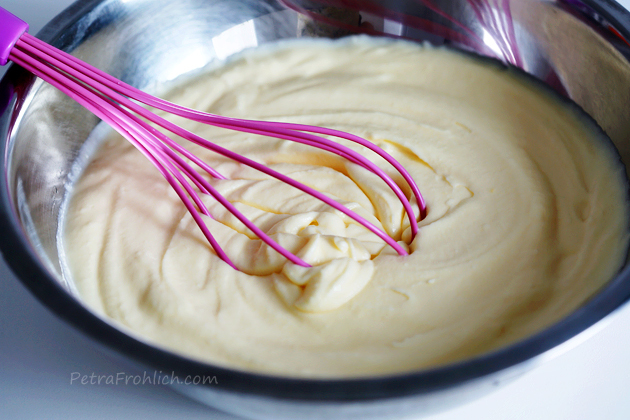 Whip until stiff peaks form. 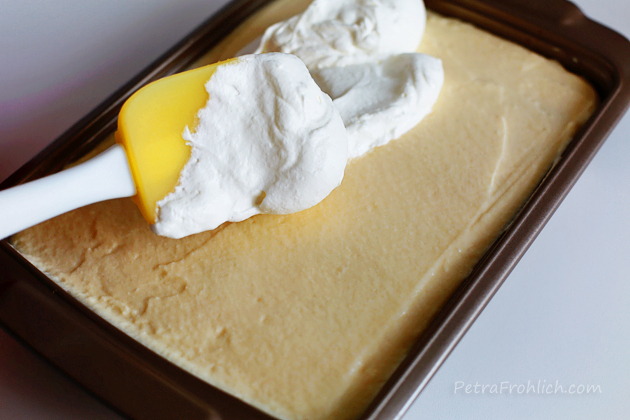 Spread the whipped cream over the mascarpone cream layer. 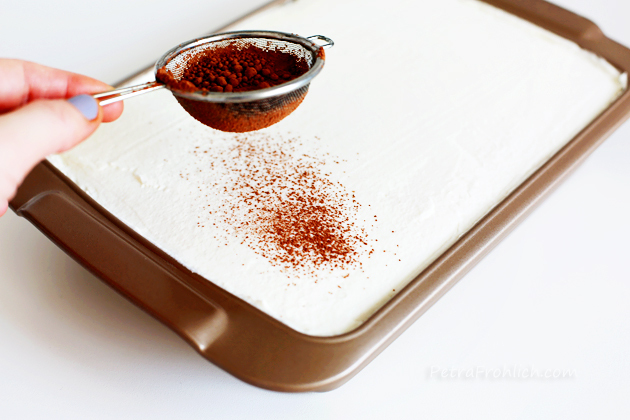 Dust the surface generously with sifted cocoa powder. And add some chocolate shavings as well. 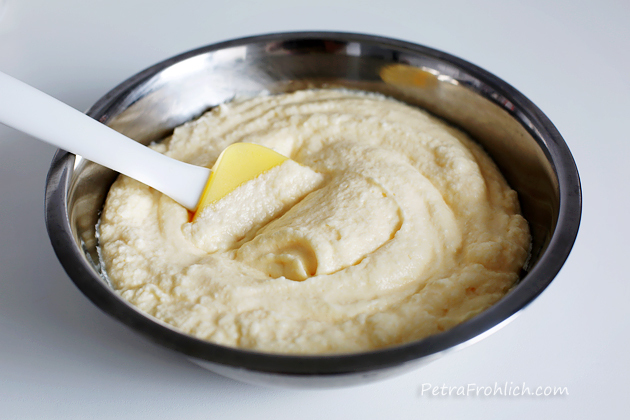 In a large heatproof bowl or pot, whisk the egg yolks and 1 cup (115 grams) of sugar until smooth and pale in color. Place the bowl/pot containing the egg yolk-sugar mixture over a pot of boiling water (so that the bottom of the bowl does not touch the water) and cook for about 5 minutes, stirring constantly. Transfer the mixture into a larger bowl and allow to cool. 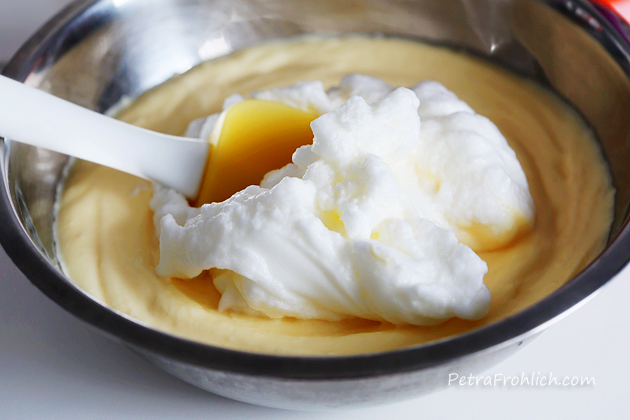 Beat the egg whites to soft peaks and gently fold it into the egg-sugar-mascarpone mixture. Place in the fridge until needed again. 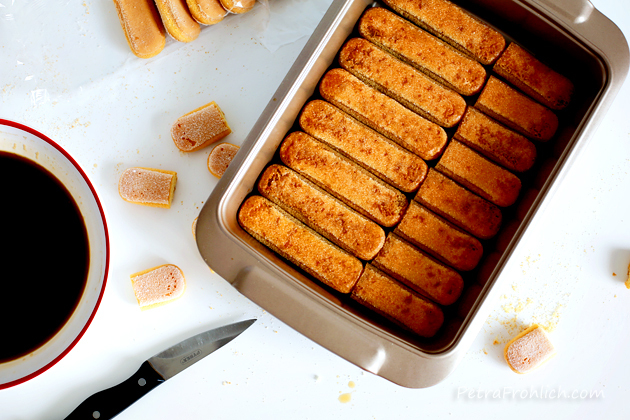 Dip the ladyfingers in the coffee-liqueur mixture and lay in rows in the bottom of a 9 x 13-inch (23 x 33 cm) dish (you might need to cut some ladyfingers with a knife to fit the size of the pan). 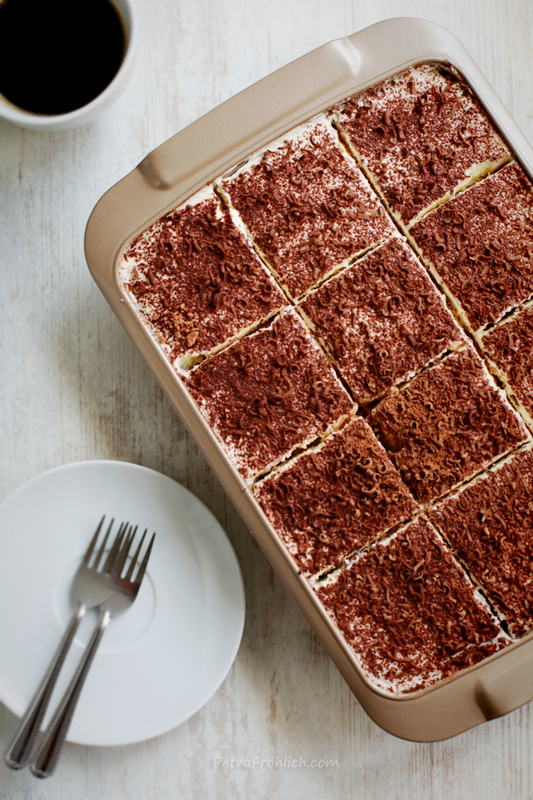 Cover the mascarpone cream with another layer of coffee-dipped ladyfingers. 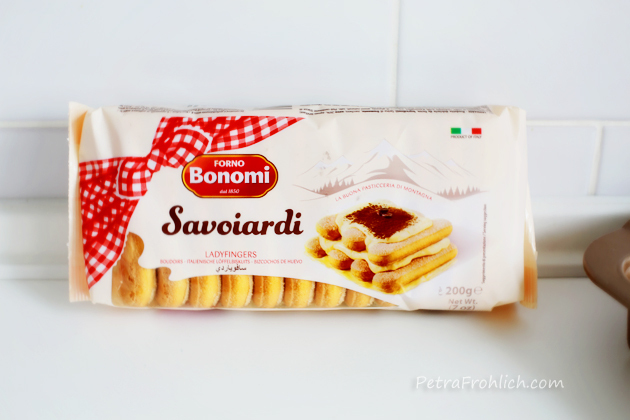 Cover the ladyfingers with the other half of the mascarpone cream. 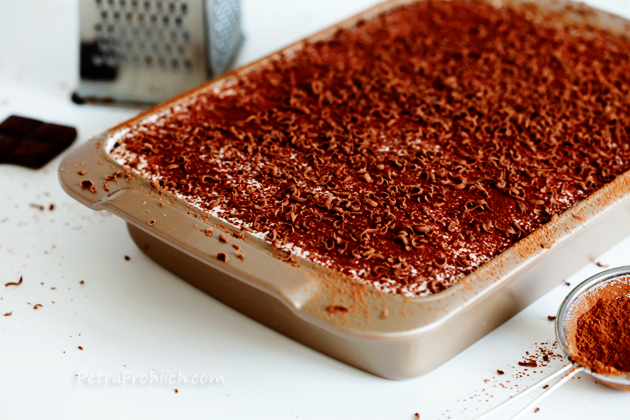 Dust generously with sifted cocoa powder and chocolate shavings. This recipe was adapted from www.gastronomersguide.com. YUM. 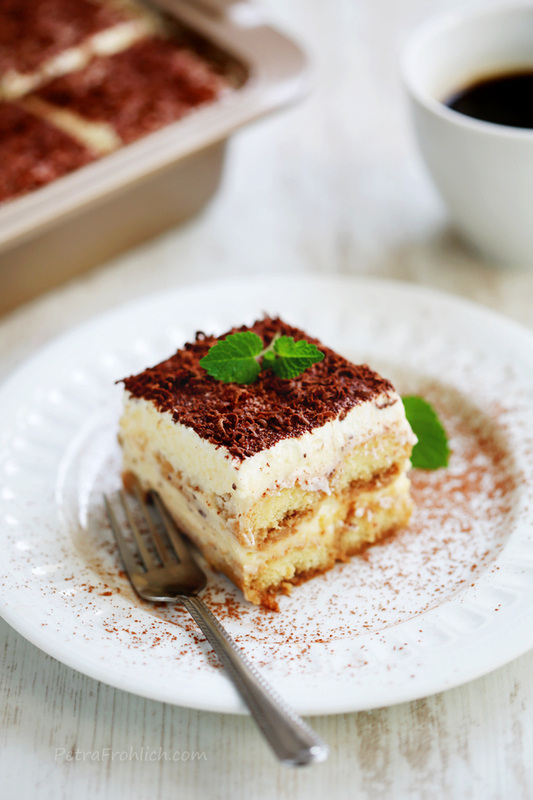 Tiramisu was all the rage when I first started working as a pastry chef in the 80’s. It got overdone…and then forgotten…but now it’s back thanks to you, Petra. YUM. I think you mean to use granulated sugar. The recipe above calls for confectioners sugar which is aka powdered sugar. I checked the original recipe and it states just sugar which I would consider to be regular granulated. Using confectioners sugar guarantees that no crunchy sugar crystals will be present. I used it and the results were perfect. I agree with Kimberly, I too use confectioners sugar. The first time I made this recipe I thought it was going to be hard but I was wrong and the benefits are oh so good. I would love to try this but we dont drink alcohol!! Any ideas as to what I could use in place of the coffee liqueur? Any help would greatly be appreciated!! Thanks!!! I think you can just leave out the alcohol. 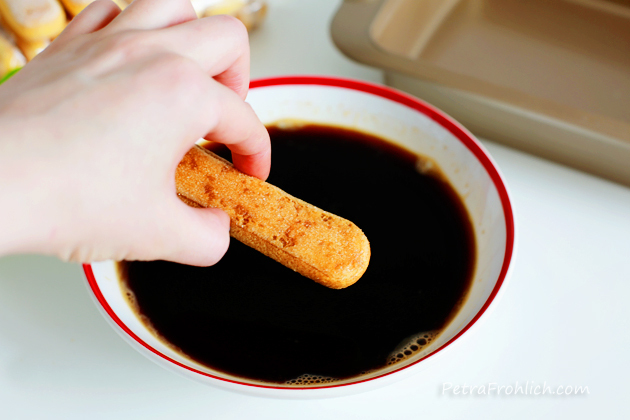 You might need a bit more coffee to soak the fingers, depending on size of dish?